Goldberg’s interpretation of the Torah is an attempt to reconcile monotheism with polytheism. A misconceived attempt, according to Scholem. Scholem could not accept Goldberg’s remythologization of Judaism. The tension between Goldberg and Scholem is resolved by the arguments of Rosenzweig and Taubes, both critical towards Scholem’s position. Goldberg’s theology has a nihilistic underpinning which is the reason for Scholem’s rebuttal. Taubes, in turn, defends Goldberg’s theology and his mythological realism against Scholem. Furthermore, he appreciates the political consequences of Goldberg’s theology. If history is the war of gods, as Goldberg claims, then the victory of JHWH would mean the end of history. The question at stake is therefore eschatological. Shall we treat secularization as a positive phenomenon from such a perspective? Goldberg condemns it and calls for remythologization. Scholem, an advocate of enlightenment, rejects such claims. Taubes, in turn, accepts Goldberg’s interpretation, but unlike Goldberg he perceives secularization as the introduction of an ultimate myth which allows history to finally fulfill itself. The article is an attempt at a new reading of The Book of Job from the perspective of Jewish philosophy – one which would include its inner contradictions and tensions, masked or ignored over the centuries by theological interpretations. The central problem which the author explores is that of law in The Book of Job, and in particular – of the relationship between law and justice. In order to understand it properly, one needs to address the fundamental paradox of the Book in which God is a judge in the quarrel between Himself and man. This suggests that what is stake is a trial not over Job, but over law itself. 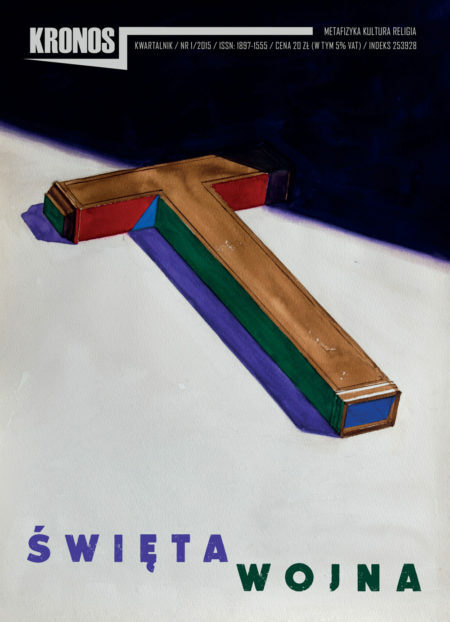 The article discusses the reception of Christian Skrzyposzek’s prophetic novel The Free Tribune [Wolna trybuna], first published in German in 1983 as Freie Tribune. Prophecy, or augury, is closely connected with the Polish Romantic tradition. It once again became important in Polish literature in the context of communism whose fall in the 1970s and early 1980s was by no means a foregone conclusion. This new prophetic strain is best represented by Skrzyposzek’s novel, inpsired to a certain degree by Tadeusz Konwicki’s A Minor Apocalypse (1979). Skrzyposzek’s main concern can be formulated thus: is the weakness and insignifi cance of Poles the product of communism, and will therefore pass away with communism’s demise, or is it the other way around – is the post-war acceptance of the communist system the result of a persistent ”Polish anthropology,” passive and unresponsive to political change? The article presents August Cieszkowski as one of the greatest modern representatives of historiosophy and messianism – a thinker who explored the neglected elements of Christian doctrine, thus moving far beyond the prevalent modes of 19th century theological and philosophical thinking. In this context, Rafał Tichy discusses – among other issues – the influence of ancient and medieval theologies of history on Cieszkowski’s historiosophy; his critique of certain elements of Hegel’s philosophy; the extent of his acceptance of the idea of constant progress (central to modern philosophies of history) and the relationship between this idea and Christian providentialism; and finally – Cieszkowski’s vision of history as divided into three stages.